Spring! Such a gorgeous time of year in Arizona and to add to it's beauty is the opportunity to celebrate Easter. 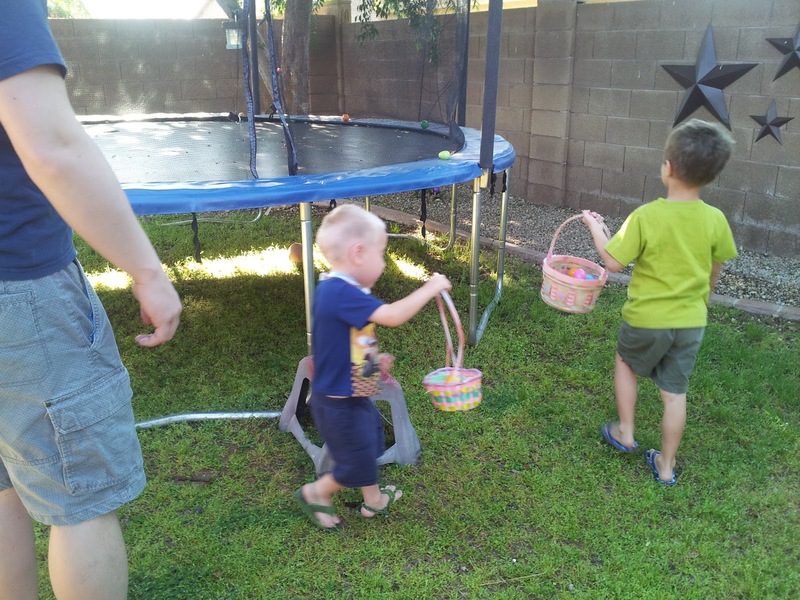 In our home... the boys anticipated the arrival of the legendary Easter Bunny. 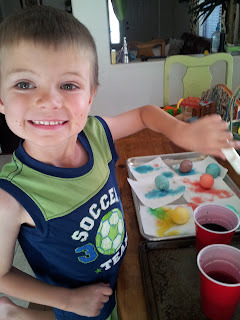 Saturday, we boiled 18 eggs and embellished them with lovely shades of green, blue, red and yellow. After many paper towels we managed to decorate all 1 1/2 dozen eggs with out a spill of food coloring. Phew! Saturday night we had a nice dinner with my side of the family. The Easter Bunny always arrives early at Grandma T's house, it has been that way since I was a little girl. It is kind of a fun tradition. After the Easter party, Ethan set out a plate of baby carrots and I was a scribe as Ethan wrote out a little note for the Bunny. Every night Emmett requires a nurse to care for him. The nurse helps to monitor his ventilator, suction his trach as needed, give medications, run his feeding pump, along with many other medical tasks. 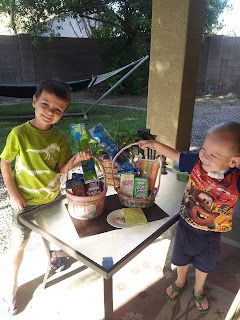 Ethan was greatly concerned that the Easter Bunny would not come to our home because Emmett's nurse was awake all night. He was afraid the Easter Bunny would see her and not stop. (I love the thought process of a 5 year old). Ethan and I came up with a clever plan.... We placed the note and the plate of delicious garden carrots out on our patio table. I ensured Ethan, that the Easter Bunny would wait until Emmett's nurse was in Emmett's room before he would make his stop at our home. 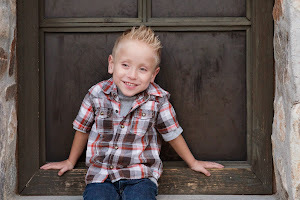 Sunday morning, Ethan was greatly relieved to see that our plan worked. The Easter Bunny did come and left plenty of delicious Easter eggs for a terrific hunt. Sunday evening, we enjoyed another Easter Feast with Michael's family. 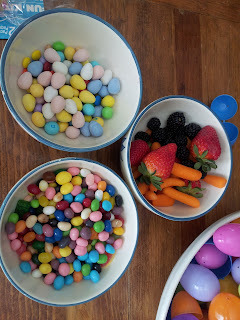 Yes, I am that mother who put fruit and vegetables in my children's Easter eggs. Sometimes I get anxiety looking at all the candy. The Easter Bunny responded back to Ethan's note... 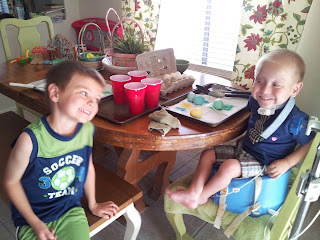 He reminded Ethan and Emmett to remember the true reason for celebrating Easter and what it means to our family. I love Spring because it gives the feeling of a new beginning. We had a nice visit with our boys as we read from the Bible the story of Christ and the atonement, His ultimate sacrifice and the resurrection. 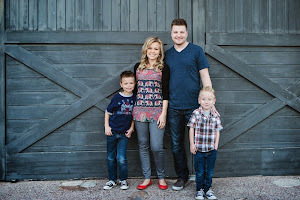 Michael and I asked both boys how it made them feeling knowing what Jesus did for them. Michael and I also showed this video for the boys to be able to see the love that our Savior has for each and everyone of us.